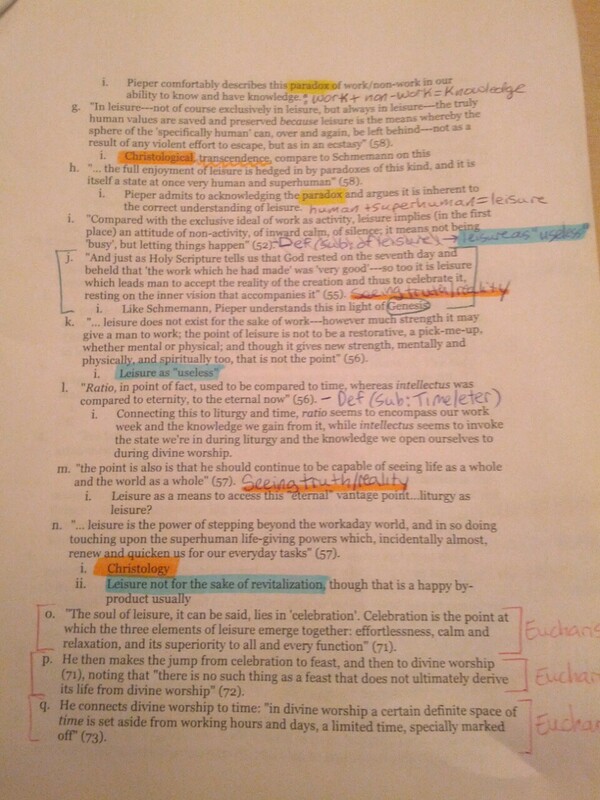 Holy 8-page single-spaced color-coded outline of quotes, Batman! I am working on my Theology term paper (described here under the heading "Present"), with a goal to have it completed and turned in by the end of this week. It's late for the semester, but my prof is on board with me turning it in as I'm able, what with Bookie and all. He'll grade it when he gets it and change my "Incomplete" to a grade for the course, no problem. Such a blessing to both work and study in a family-friendly environment. 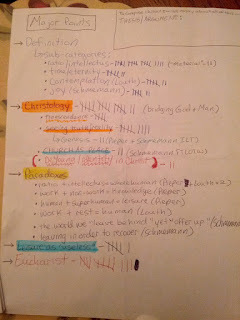 The end of last week and the beginning of this one saw me mining for relevant quotes the texts of my four main sources (with a fifth source waiting in the wings if needed) and copying them into outline-form. 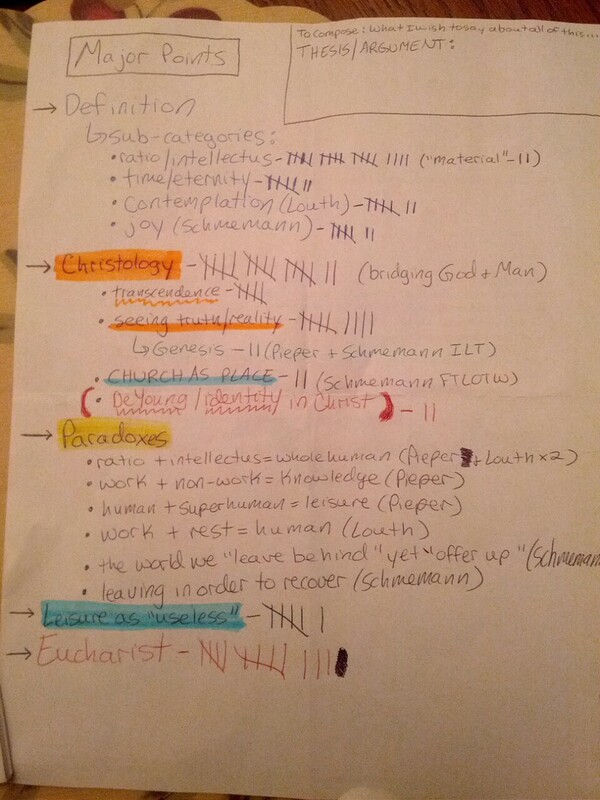 However, the quotes are organized by source, not by topic/point, so my next step was to organize the quotes according to what point each will help me make in the paper. 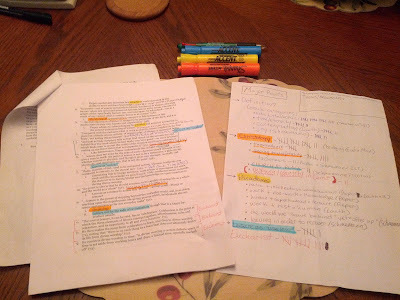 Now, in the distant past that was my undergraduate years, what I would do to organize the "evidence" (that's the quotes I've collected) is to color code what I have. I'll admit that in grad school I got a little lazy and would often just start writing the paper at this point, hunting through my collection of quotes as I go. 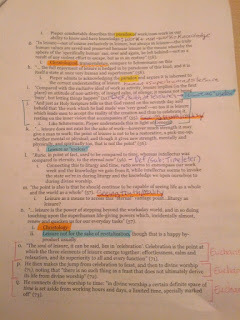 While it cut out a huge step (the color coding part), it lengthened my writing time in the long run because I'd often miss something super important, have to return to that part of the paper and insert the additional quote/point while attempting to make the insertion as organic-sounding as possible. 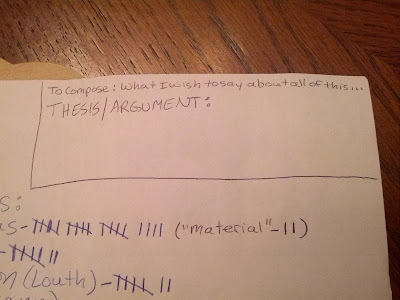 I can write a decent paper that way, but for this class I really wanted to return to my more organized, slightly OCD way of writing a paper, in large part because this paper will be absorbed into my Masters Thesis, which I'll be writing much of next year. I figured, best to get my methodology back up to par before tackling the project that will be my Thesis. Sample page of my "evidence"
I'm posting this because I wanted to record where I'm at in the process. 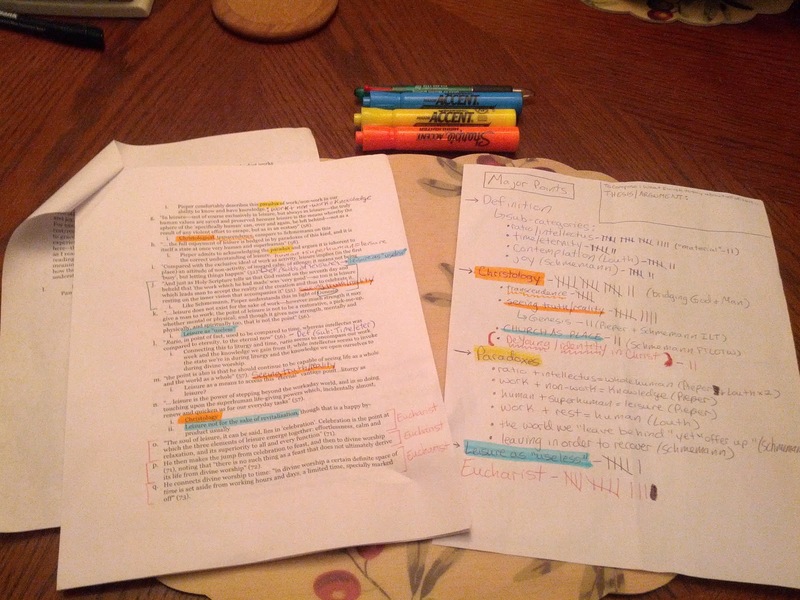 After putting in three hours of analog work with these texts, using nothing but colored pens and highlighters, and being able to say I can see the shape my paper is taking so very clearly now as a result... I feel so refreshed and ready to begin writing tomorrow. And that feels good. Oh so good. What the heck do I want to say??? Ahem. Still a ways to go, but a few steps closer than I was. Time to go unwind with the hubs and Bookie, then tomorrow: begin again.